Two popular actresses Yvonne Okoro and Lydia Forson are said to have declined to feature in a movie because Rosemond Brown would be star in the movie too. 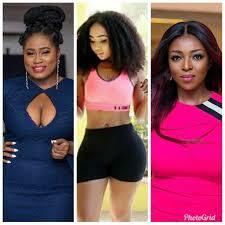 Information reaching YEN.com.gh has it that 2 of Ghana’s high actresses, Yvonne Okoro and Lydia Forson, have rejected a new movie role thanks to Rosemond Brown. The two initially had accepted the scripts to act, however, upon discovering that Brown was a part of the cast, set to opt out. The producer of the movie titled Away Bus, Kofi Asamoah, was said to have hidden Brown’s identity, but once he later disclosed it to the team, Lydia Forson and Okoro said they were no longer interested. In a post sighted by YEN.com.gh on a popular Instagram page, Thosecalledcelebs, Lydia said her brand was too sophisticated to act with the likes of Brown, also known as Akuapem Poloo. Okoro did not state her reason although, however she was reported to have screamed “hell no!”, and backed off. Some social media users who commented on the issue have expressed disappointment in the 2 actresses. She has been tagged as common, desperate for fame, which makes her behave in certain ways not expected of her. She had even gone ahead to require off her attire in public all because she needed to trend within the news.